Mother’s Day is around the corner and it’s time for you to give your mom something special. So I’m going to show you how you can sew a colorful and beautiful bouquet of tulips yourself. You can combine your favorite colors or Mamas and the best part is: it will always remain fresh and an eye-catcher. Cut circles out of the colorful fabrics with a diameter of 20cm. A circle cutter is a great tool but if you don’t have one just use a bowl similar diameter. Then, fold one of them in half and cut it. Turn the fabric into a cone and proceed with other semicircles. Cut the green fabric into strips (3 cm wide) and the length slightly shorter than the stick. Repeat it till the numbers of tulips you want. Take the green fabric you cut earlier and turn around and stick double sided tape or use glue to stick it around the stick to create a stem of a tulip. Take the earlier fabric you sew into a cone and stuff it with cotton. Then, take a needle and thread to sew the open edges. Put the pointed side of the stem into the tulip(you can put some glue to it too) and sew it just like the picture above. Cut the green felt into a leaf shape and glue it to the stem. Use a peg to peg the leaf and the stem together till the glue dries off. Let it dry well and you will have a bouquet of tulips ready for Mother’s Day! Hope these easy projects help you with your MOTHER’S DAY gift idea and hope you enjoy making it!!! #LIKE & #SHARE Our Page #TODAY! Posted on April 29, 2016 April 29, 2016 by doshisewingmachineryPosted in DIYTagged #doshisewingmachinery, #doshistitch, #happymothersday, #lovesewing, #mesinjahit, #mothersday, #mothersdayproject, #sewing, #sewingmachines, #tulip, DIY, Info. SCRAP FABRIC PROJECTS for EARTH DAY!! Cut scrap fabric into 8 pieces by 2.5″ squares per hand towel. Sew them together, then lay it on the towel to make sure it fits. Iron sides in 1/4″ to the underside, like a seam. Lay patchwork onto the towel and pin it down. Measure 4.5″ from the bottom of the towel and make sure it was straight. Stitch on patchwork strip, folding under the very ends of the strip when you get close. Choose an old t-shirt and smooth it flat on a table. Cut and remove the sleeves and make sure you leave the seam in place—this keeps your tote strong! Position a plate about halfway over the neck opening of the shirt. Trace the plate with your pencil or pen. This will be your cutting line to create the opening for your tote bag. Cut along the traced line. Turn the T-shirt inside out and pin the bottom of the T-shirt along the hem. Sew the bottom of T-shirt hem closed. Reinforce your tote bag by sewing over this seam a second time! Turn the shirt right- side- out. YOU just made your own recycled tote bag! T-shirt Totes are Machine Washable, Reusable, and Strong! Just say NO to “paper or plastic”! Cut the scrap fabric into a triangle shape and place it above a bookmark. Sew them or glue them into the bookmark. You have yourself a custom made bookmark and it could be a gift too. All you need a wooden photo frame. Cut the scrap fabric into strips approximately 1 inch in width and place them on the photo frame and make sure it fits.Then sew the strips together. Place them again on top of the photo frame and glue it, then cut a square hole in the middle for the picture to be seen. First off decide what scraps you’d like to use, and iron on the medium interfacing to the wrong side of the fabric. If you’re going to do an applique or buttons, trace around your pattern onto the right side of the fabric so that you know how to place it. Added a quick appliqued C to this one. Then iron on the Peltex to the wrong side of the fabric according to the directions. Make sure you iron it to the side you want to be the “front” of your key chain. Cut it out, along with the back of the key chain. Place wrong sides together, and place two pins about 1″ or so apart on the bottom. Sew from pin to pin, around the circle, about 1/4″ away from the edge. Then trim the edges all the way around with pinking shears. Cut a piece of your twill tape or ribbon about 2″ long. Fold it over your key ring, insert into the opening on the bottom of your key chain, and sew the opening closed, backstitching at the beginning and end. PULL your scrap fabric out. You can just throw them all over the floor for this one. And don’t weed out fabrics if they are unique. I used a fleece for North Dakota (you can use any map you want), a knit for Kansas and a silk in Illinois. It adds some neat dimension to use different fabrics. Print off the map, in poster size. There will be a bunch of sheets like above picture. Tape it together, overlapping and trimming as needed. Now find a piece of fabric that you think represents the state in some way. Repeat it as the states in the map as been cut it out. Then iron to a piece of muslin in its spot. I made sure to cut out one state at a time so I didn’t get any mixed up. Keep going until you have all the states on there! When they are all ironed on, topstitch around each state.Just remember that because this tedious. Backstitch where necessary to keep your stitches sturdy. Stretched it around a piece of plywood and glued the back.Then glue on a piece of lace on the back and you’re ready to hang it! Hope these scrap fabric projects gives you some ideas for weekends activity with your loved one this earth day! Posted on April 22, 2016 April 22, 2016 by doshisewingmachineryPosted in DIYTagged #craft, #doshisewingmachinery, #doshistitch, #earthday, #lovesewing, #recycle, #scrapfabric, #sewing, #sewingmachines, DIY. Did you know you can use your serger to gather fabric? Imagine the possibilities ~ no more knotted or broken threads when you gather fabric. Set your serger for 4-thread serging. Serge along the raw edge. You will notice that it does a little gathering. This is normal. Notice the two needle threads (the black threads). Near the fabric edge, put a needle underneath the two parallel threads. Be sure not to catch either of the looper threads ~ it will knot if you do. Just the needle threads. Pull the two needle threads out of the chain of threads. Do not let these get tangled. If you do this correctly, they will slip out easily. Pull the two needle threads to gather your fabric. Voila! You will have a nice and even gathers that can easily be adjusted and then attached. No, stray threads that end up on the outside of your project. Posted on April 4, 2016 April 4, 2016 by doshisewingmachineryPosted in InfoTagged #doshisewingmachinery, #doshistitch, #lovesewing, #mesinjahit, #serger, #sewing, #sewingmachines, #sewingtips, #tips, Info. Suitable for making decorative zigzag stitches on woman’s garments, handkerchief, tablecloths, formal dresses, children’s wears, sports wears and pillowcases and not forgetting tudung too. Posted on March 31, 2016 March 31, 2016 by doshisewingmachineryPosted in New ArrivalTagged #doshisewingmachinery, #doshistitch, #eyelashmachine, #jingong, #lovesewing, #mesinjahit, #newarrival, #picot, #picotmachine, #sewing, #sewingmachines, #siruba. Have a little time to sew and want to make something quick that packs a big punch? Here are some easy sew Easter projects that will have you hopping out the door in no time with your finished projects! Grab your favorite fabrics and get to work! Cut TWO layers of burlap into a rectangle. Size depends on how big you want your bunny to be but I’d say anywhere from 5-7″ in width and 10-13″ in height is great. Then cut a deep “V” at the top for the ears. Put right sides of burlap together and pin in place. Sew a straight stitch along the three straight sides of a rectangle, leaving the top open. Clip corners. Turn inside out and then sew a straight stitch up the sides of each ear. Fill burlap “sack” with dry beans, rice, etc. and then tie closed with twine, yarn, embroidery thread, etc. And then you’re done! Bunny ear pattern for fabric and fusible web, cut apart. Download HERE. Pin two layers of fabric (wrong sides together) and the bunny ear pattern together and cut out. Cut out fusible-web with the pattern for the fusible web piece and place between the two pieces of fabric as well as a piece of wire 7-8″ long. Follow the directions on how to use your fusible web. Place another fabric piece on top and iron pieces together, making sure wire is running down a center of pieces (again, follow the directions for your brand of the fusible web here). 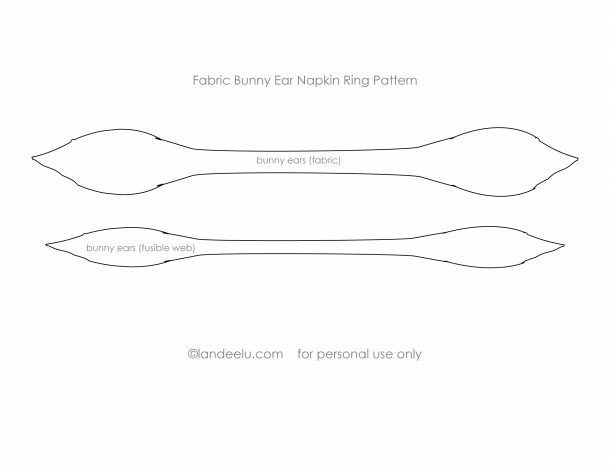 Wrap around napkins and twist together to make your cute little bunny ears! Start out by smearing fabric glue around the outside of your box and then wrap the batting around it. Next up lay your fabric right side down on the table and measure off a section the same height as the sides of your box (mine was 7cm). Paint that section with fabric glue and then wrap around your box. Once you’ve folded all that fabric in it’s time to make the inside base (which will cover up all that extra folded fabric). Take your lid, cut the lip off of it and then trim it down so that it will fit snugly inside the box. Using your fabric glue again stick some more batting to the circle and trim it into shape. Then cover your circle in some more fabric. Leave it to dry for a couple of minutes before pushing the circle down into the inside of your basket. Attach some ribbon to the underside of your basket with hot glue and then secure the ribbon up the sides of the basket using some more fabric glue. Glue a thick ribbon around the base of your basket. Last but not least make a sweet little pom for the bunny tail and hot glue it to the front of your basket. Done! One very sweet little Easter Bunny Basket! You arrange your easter eggs into the easter bunny basket. Prepare the tools such as plastic eggs, newspapers, PVA glue, paint brush and scissors. Then stick on a layer of plain paper on the plastic eggs due to the lurid colours. Instead of cutting the newspaper tear them into long strips to get a softer edge which blends into each other better when pasted down and glues them on the plastic eggs as shown on above picture. Once all the layers were completely dry, it was time to get creative. Find images such as botanical, butterfly and etc to create a themed version easter eggs. Cut out your chosen image, being sure to trim the design as closely as possible. Then place the image on your egg using more of the watered-down PVA glue. You will have nice vintage easter eggs for this Easter Day! Hope these easy projects help you with your EASTER DAY decoration and hope you enjoy making it!!! Posted on March 18, 2016 by doshisewingmachineryPosted in DIYTagged #bunny, #doshisewingmachinery, #doshistitch, #easterbasket, #easterday, #eastereggs, #easterproject, #lovesewing, #mesinjahit, #sewing, #sewingmachines, DIY. IF YOU ARE SURROUNDED BY BOOK AND YOU HAVE A SEWING MACHINE AT HOME? THIS WOULD BE A SIMPLE PROJECT YOU CAN DO ON WORLD BOOK DAY! Cut fabric to your desired length and width, allowing for a half-inch seam allowance on all sides. Add an additional two inches in length for “each” pocket, that will be created at both ends of the cover. This should create a long rectangle. Hope you enjoy making it!!! Posted on March 4, 2016 March 4, 2016 by doshisewingmachineryPosted in DIYTagged #bookcover, #doshisewingmachinery, #doshistitch, #fabric, #fabricbookcover, #lovesewing, #mesinjahit, #sewing, #sewingmachines, #worldbookday. Posted on March 3, 2016 by doshisewingmachineryPosted in Pre-Owned SalesTagged #doshisewingmachinery, #doshistitch, #fy14u, #lovesewing, #mesinjahit, #preowned, #promo, #secondhand, #sewing, #yamatamachine.